This is the theme of an email I received from a Monastic Immersion Weekend guest this morning. The MIW ‘changed his life’ and I think changed a lot of lives. 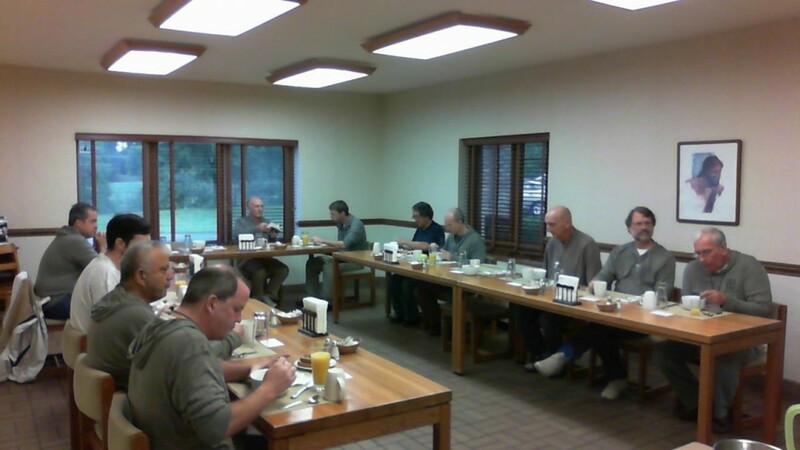 This was a special retreat for 16 men living with the monks for three and a half days, praying with them, listening to them in conferences, interacting with them all weekend long formally and informally. There is something almost indescribable about living together and doing everything together at the monastery for three and a half days. You not only get to know each other, but you get to know yourself better, which is what I think that MIW participant was saying. 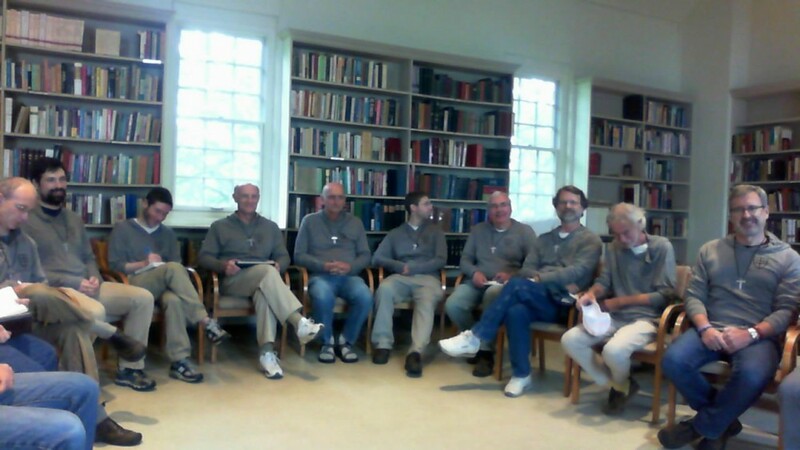 The combination of silence with communal prayer is really what the monastic life is all about and what we can take from the monastic life while living in the world. Father Joseph set the tone for the weekend during the orientation and question and answer period on the first night. Helping us see the time we will have as important in our spiritual life and encouraging us to be present in the moment during the weekend. Sister Kathy Ullrich’s teaching on Saturday morning about ‘contemplative life today’ helped us understand Fuga Mundi–the flight from the world–that is at the heart of monastic life. But she helped us understand it from both her perspective and ours! Fuga Mundi doesn’t have to mean leaving for a monastery if our hearts are also seeing opportunity to ‘flee the world’ at times in our everyday lives… we can find silence and solitude even in the midst of our busy lives. We can find community too, in our family and church and perhaps prayer group. Father James helped us understand work as prayer–ora et labora–prayer and work… He helped us understand ‘how’ we work matters as much as what we work on. That intentionality-being present in this moment and this time doing this task, is in fact prayer. And being distracted or just getting the job done to get it done isn’t…that’s just work. Then on Sunday as a wrap up we had a conversation about how to take some of this stuff home with us. We looked at the basic components of monastic life and asked ‘what can I do with this?’ We realized we too can have a rhythm of prayer; we can also make our work prayer; we can find communities that reinforce our relationship–and dependence–on God. In fact we found a lot from monastic life we can use in our lives. 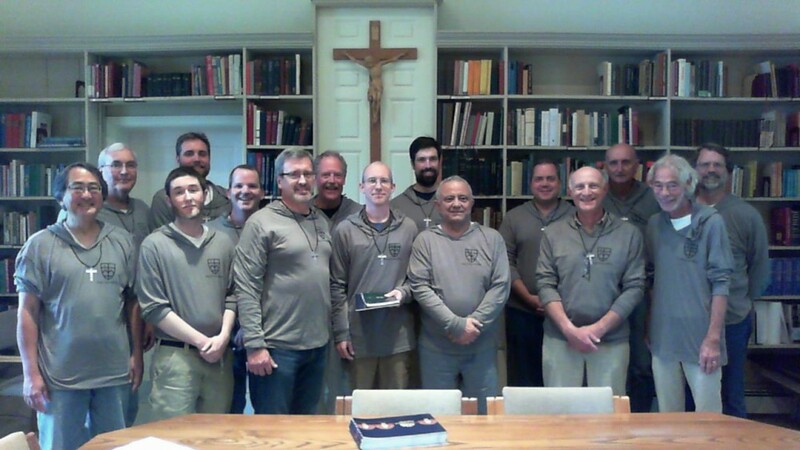 We had a great weekend together–the participants in the MIW and the monks–because the monks get as much out of this interaction as the retreatants do. And oh how we loved adding 16 voices to choir! We began to sound like the Mormon Tabernacle Choir by the end of the weekend (well, not exactly). Dear post-MIW’s: Mormon Tabernacle Choir? Oh heck, why not? Go for It! Happy Monastery-At-Home to all of you! Come back soon – please – the monks are Still Here.